Because there are so many new arrivals in Korea recently, including us, BP decided to get us all together to get to know one another and stuff like that. 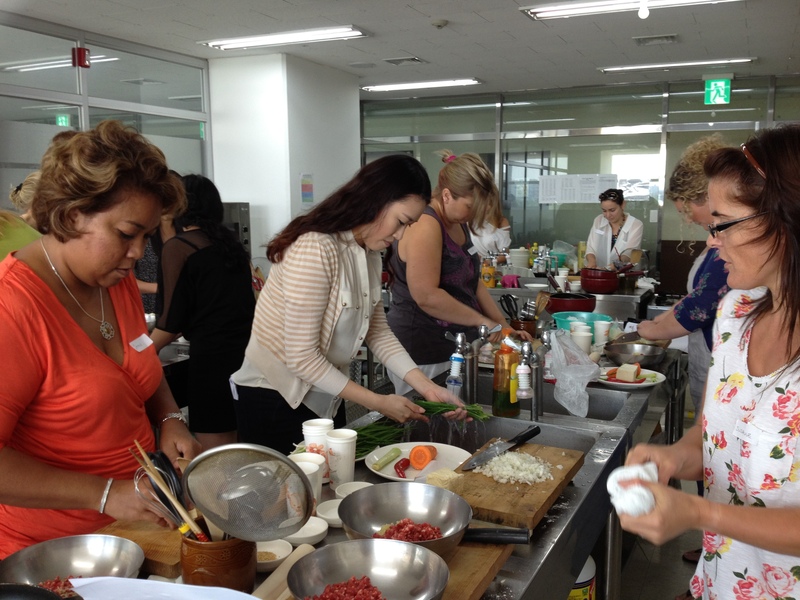 A few different options were discussed but eventually a cooking class was picked as a good ice breaker. 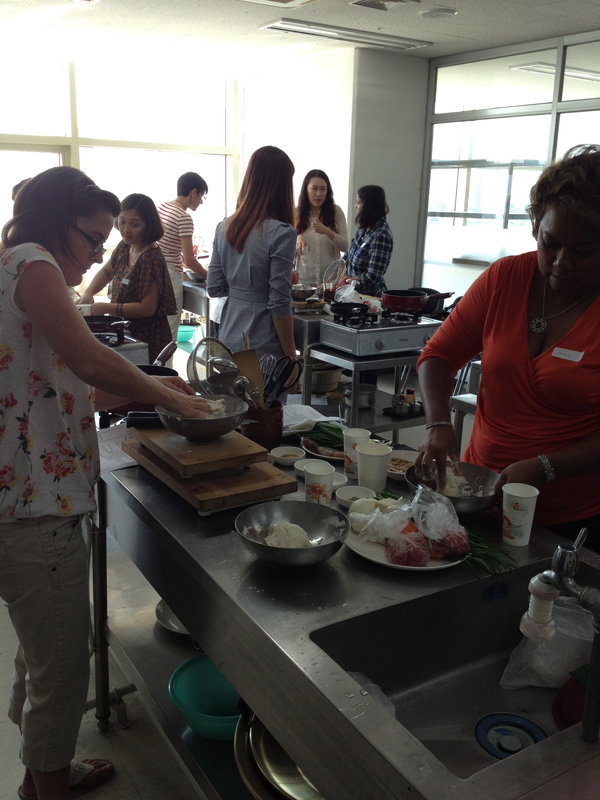 And when in Korean, what else could we learn but some Korean food. 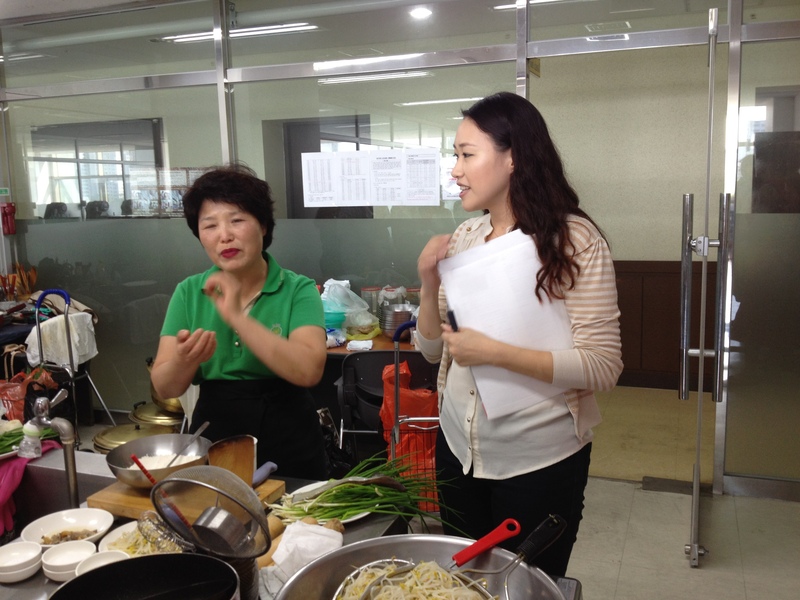 Firstly I am fussy eater and there are somethings I really don’t like, which pretty much seem to be everything that the Koreans do like, seafood, (very) spicy and mushrooms, especially mushrooms. Secondly, I just couldn’t be bothered. Very bad of my I know, but I have met so many new people in the last few weeks, from the BP wives, mum’s from school, neighbours in the building, friends of friends that it feels a lot like new people overload. I was having a bit of a blughhy week and meeting new people is always an effort, I tend to talk too much and I am trying to cut back. 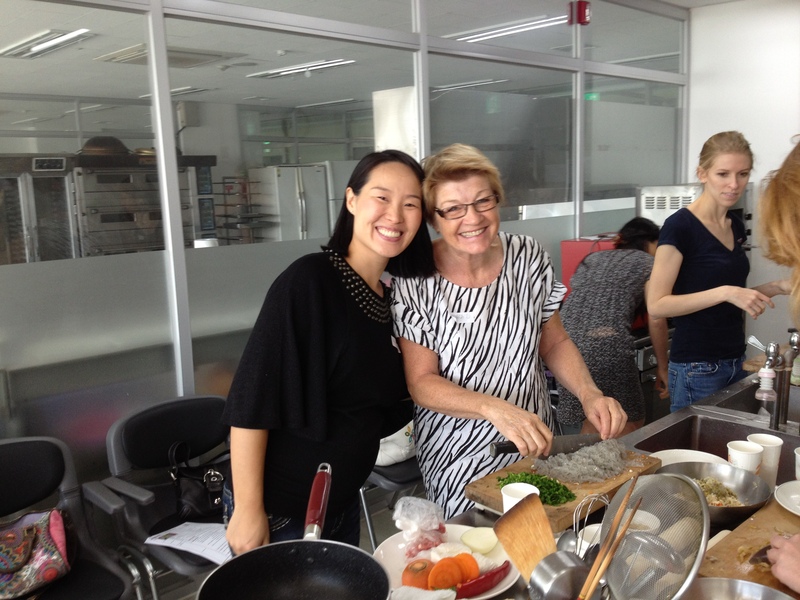 I agreed to go as I knew that it would be fun, I would meet more people, which in an expat world is always good ,and I didn’t actually have to eat anything if I didn’t want to. There was a few of us from this building so we got a taxi, fortunately one of us knew where we were going as I am not sure I would have found it otherwise. 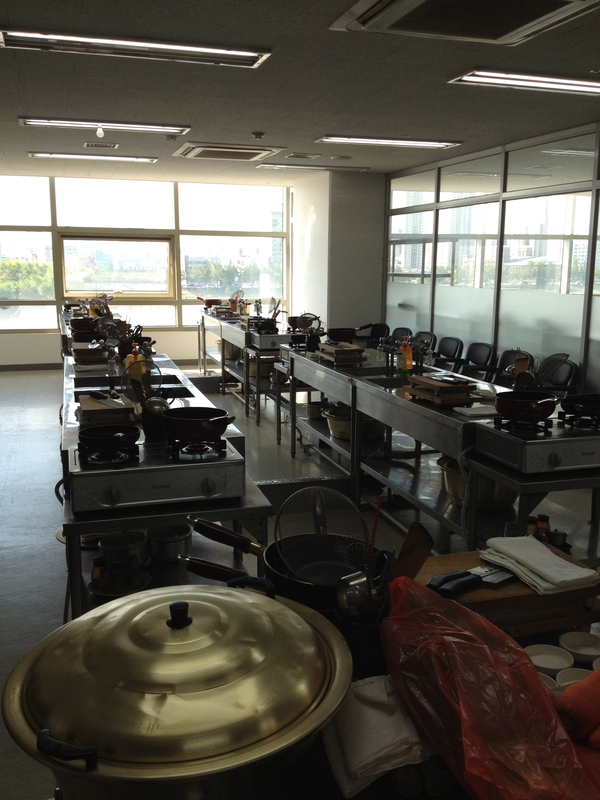 It is on the 4th floor and every room is kitted out for cooking, or baking classes – there was even one that was the roasting room for teaching the mysterious art of coffee making. 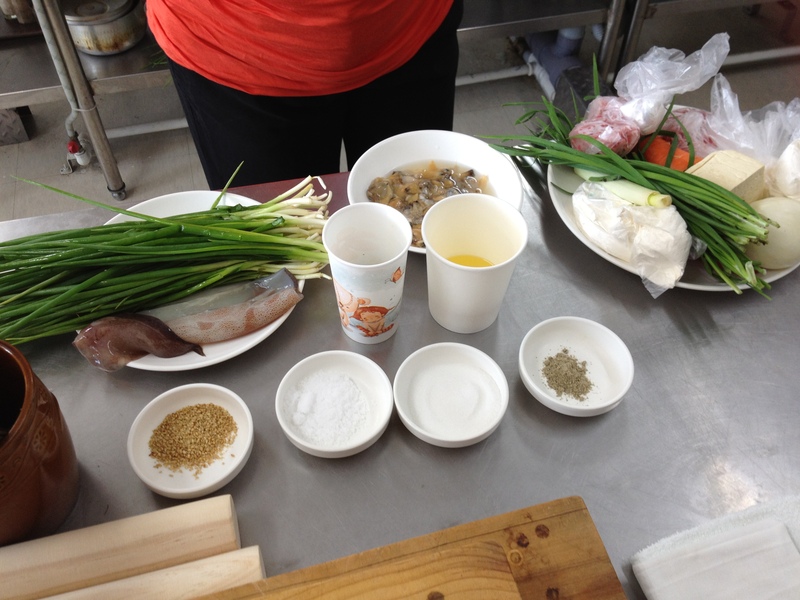 We were given our recipe sheets and my worst fears were realised – squid! All the ingredients were neatly set out for us at our work stations. Though I still don’t know what the sugar was for. Before we got going our teacher gave us a demonstration at the front. 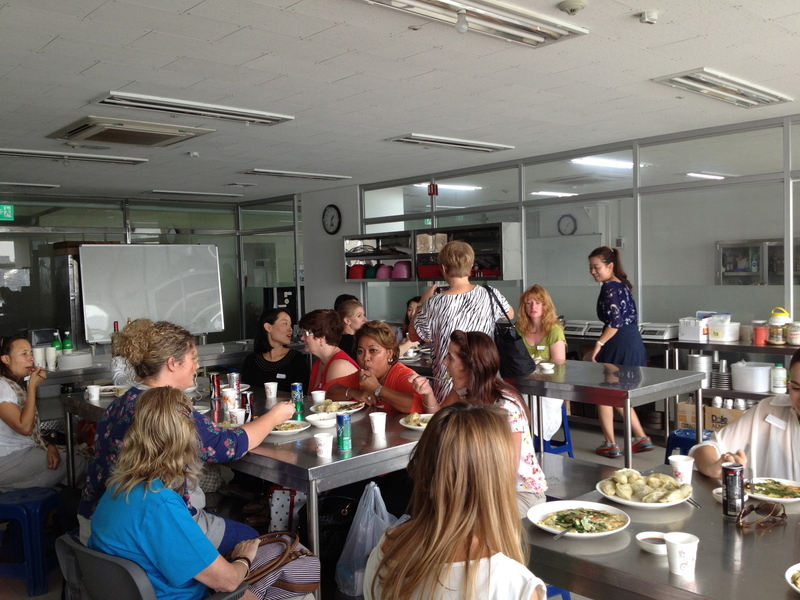 The woman in the green was our teacher and the lady next to her, Donna, is from Coens – the company who looks after us, and she translated. She was explaining that we should use our hands to prepare the food as our ‘energy’ will pass though into the food, making it healthier and tastier, but if we were seriously ill, such as cancer, then it would make the food not taste nice. I was placed with two people I didn’t know, which I was a little uncomfortable with at first but then I was really pleased as the whole point of being here was to meet new people and how would I do that if I was paired with someone I already knew. The room was now busy and noisy. 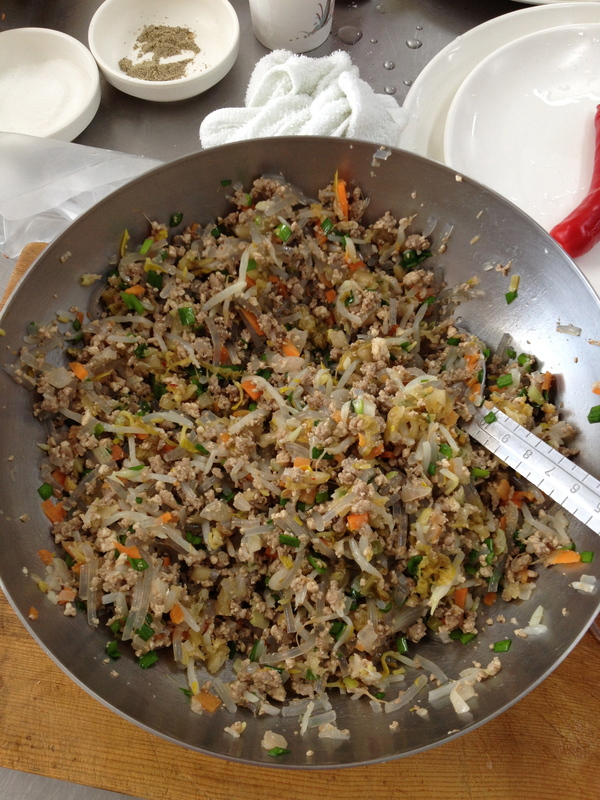 First we had to make a meat and tofu filling which we then put into dumpling pasty and steamed. 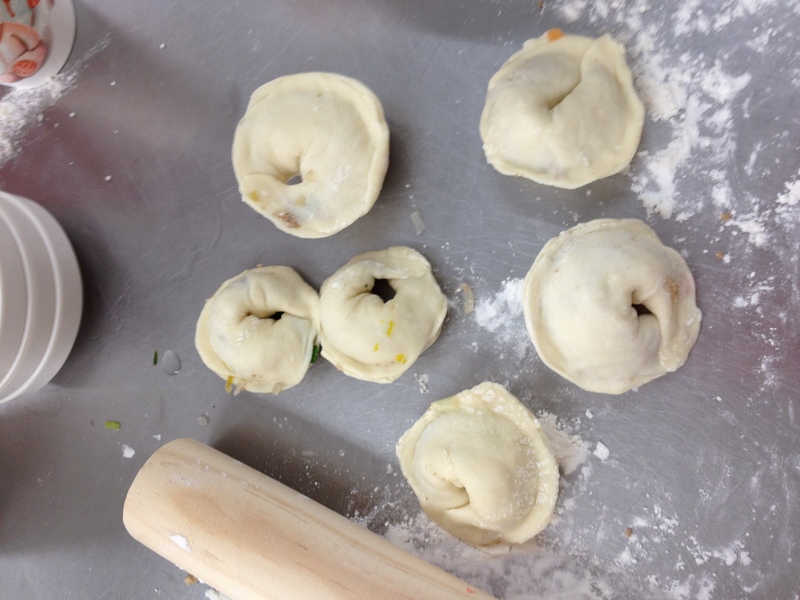 We had to make the dough for the dumplings, which was just flour and water so a bit bland. I slacked off the cooking a bit and took some photos. here I am with Kathryn, also from my building. 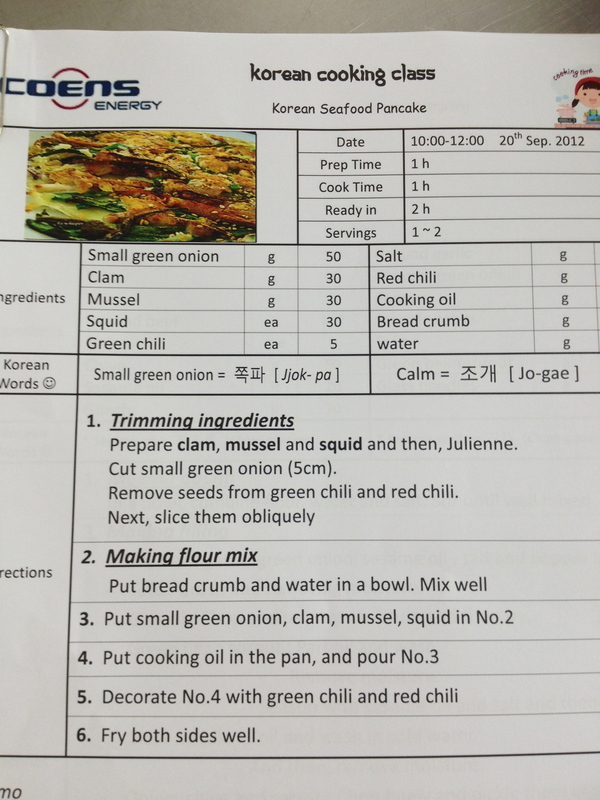 Then the part I had been dreading – the seafood pancake. Fortunately, we only had one piece of squid and Jamie was perfectly happy to deal with it, so I didn’t even have to touch it. 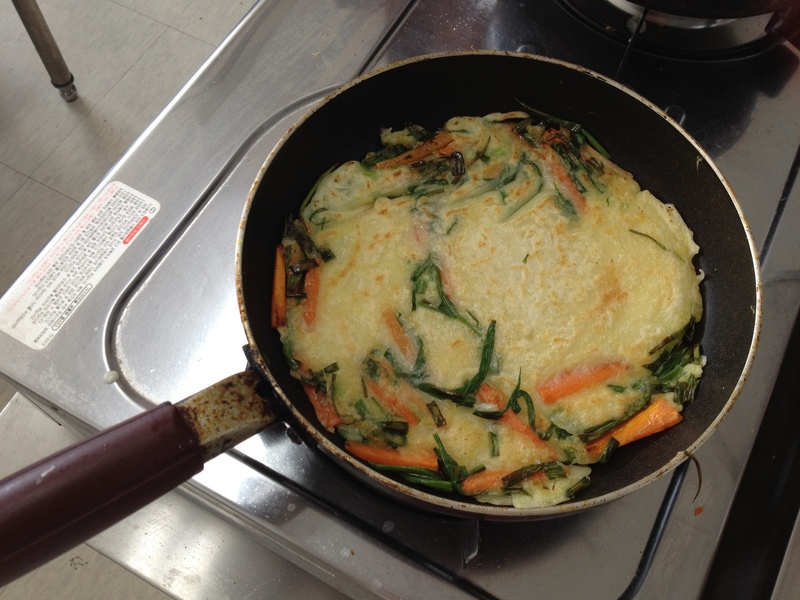 I decided that I would make my pancake a seafood free one with just spring onions and carrots. 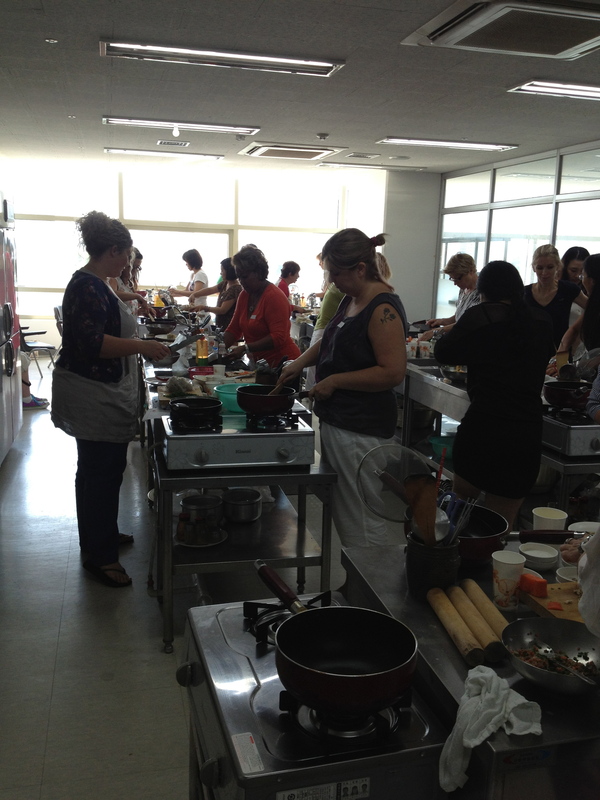 It was a bit odd this being part of a class as it was just make up the pancake batter from the packet and then fry. 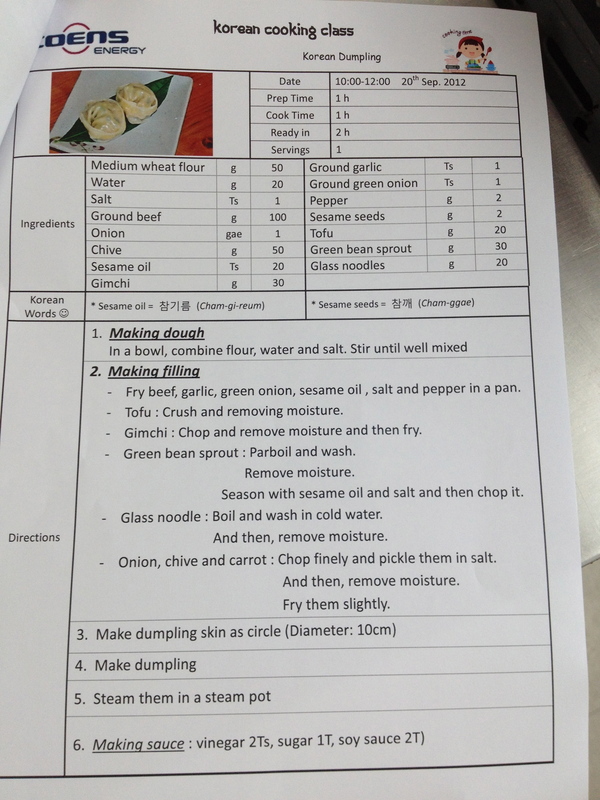 The dumpling were now steamed – ta-da, my finished meal! I have to admit I had some peanut butter and crackers once I got home! The class was good fun but it went on too long, we got there at 10.30 and I left (escaped) about 2, it was really good to meet some more people, especially those who have been here a while and can give advise. My two team mates, Jamie and Suzanne, were brilliant and a really good laugh. 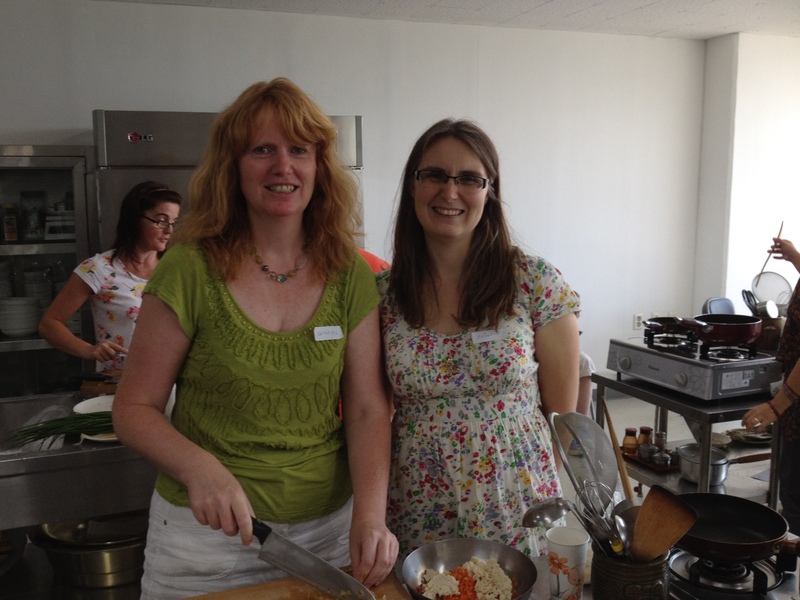 Here are the recipes in case you fancy trying them out for yourselves. The breadcrumbs are really pancake batter mix. 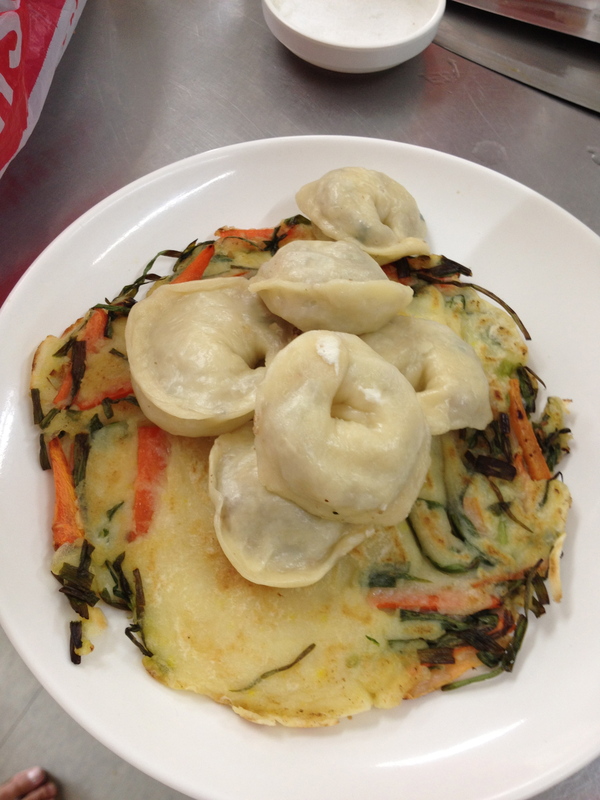 The Gimchi, is normally written as Kimchi and is a Korean speciality of highly spiced pickled cabbage. One thing I did learn is that the glass noodles are made with sweet potatoes; not attractive when cooked, they are a sludgy grey sticky mess. One really good thing that came out of the cooking class, was a heads up about where I could get a kitten (like that was ever a question). I will tell more about that tomorrow. I have always found it hard to convert people I am friendly with, into friends. How do you go from someone you say hi to dropping children off at the bus to someone you meet for coffee? Children help, they don’t have the same reserve and reticence but there is still a jump from chatting to someone in the bus to going for playdates. 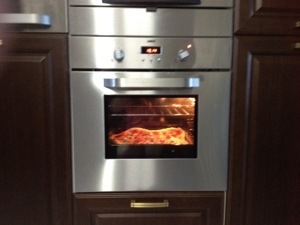 But I have come up with a solution – pizza! I invited the mums with children the same age to join us at the climbing frame after school on Friday and I brought the pizza, the one thing I can cook consistently well. 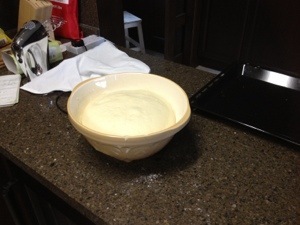 The dough has risen nicely, my favorite part is knocking it back and squishing all the air out. 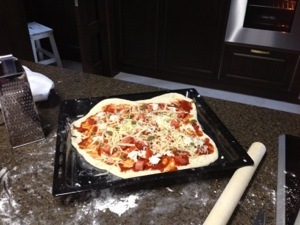 Here it is very to go into the oven. Then the hard bit, leaving it in the oven long enough, when the house is full of wonderful smells. Pizza face! 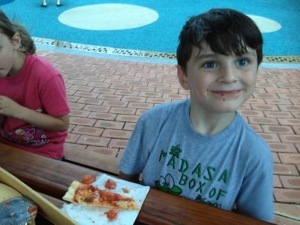 Gregor does enjoy his pizza, he ate more than anyone. Here are my two playing once the food had been devoured. 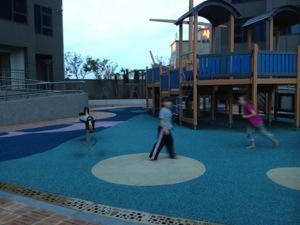 There were other kids here, but I don’t want to add their photos without asking first, how is the best way to ask if you can use photos for a blog?